We drank a ton of great beer last week! And like last week those beers fall squarely into to two quite dissimilar categories - stout and sour. 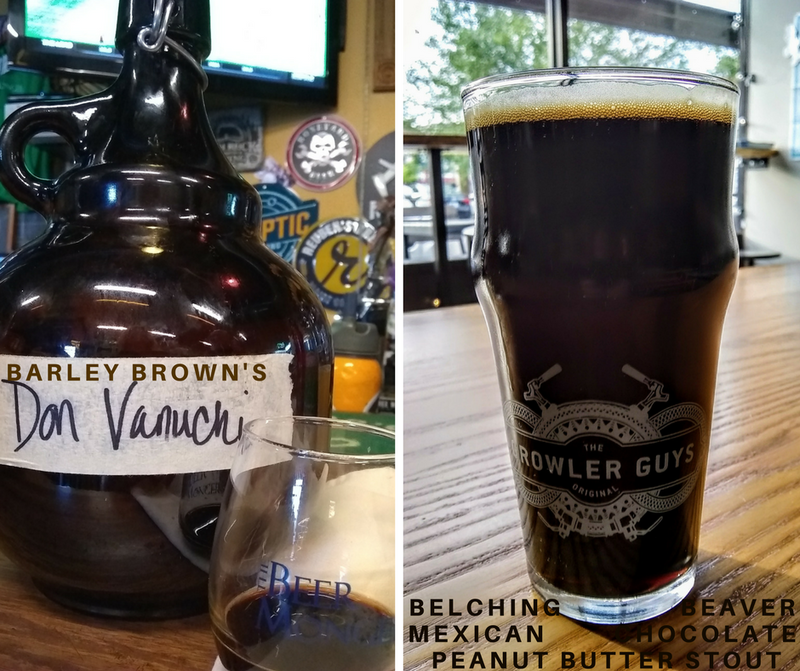 Barley Brown's Don Vanuchi 2017 - This first beer is one we were lucky enough to drink thanks to Chris' recent trip to Eastern Oregon, which included a visit to his favorite brewery, Barley Brown's. In past years this Russian Imperial Stout has been barrel aged and while we enjoyed that, it really shines without the addition of the qualities the barrels imparted. It drinks bitter, like really good dark chocolate, which pleasantly masks the 9.5% ABV. Adroit Theory B/A/Y/S (Ghost 546) - Another Russian Imperial Stout, its cocoa-bitter flavor is balanced with just a touch of sweetness making for a very drinkable 10%. Belching Beaver Mexican Chocolate Peanut Butter Stout - Formerly called Viva La Beaver and Living La Beaver Loca, the aroma is predominately peanut butter with the flavor speaking more to the chocolate/cocoa part of the name with just the slightest bit of heat. It's no surprise that it is Belching Beaver's highest rated beer and that it has been awarded numerous gold and silver medals. Allegory Fresh Pints!!! 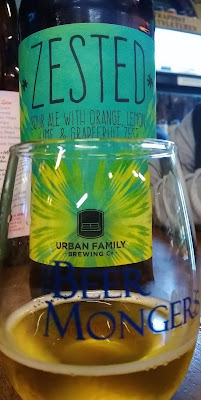 - This 4.2% fresh hopped sour ale starts with a great sour aroma, followed by a pleasant, drinkable sour flavor with just a touch of the characteristics from the fresh hops coming in at the end. A refreshing beer and a refreshing take on a fresh hop beer at a time when so many places default to an IPA, pale ale or red ale base. O'so Tuppen's Demise - Shared by another Chris (who also goes by Tappan, not to be confused with the name of this beer), it's an outstanding blended barrel aged tart beer that's lightly effervescent and displays a gorgeous rosey color from the Michigan blueberries in it. Flat Tail Dam Wild Raspberry and Lime - Flat Tail continues to impress us with their sour beers, this one full of berry flavor tempered every so slightly by a splash of lime. Clocking in at a surprising 7.5%, it's easy drinking and perfect for Indian Summer days. Urban Family Zested - A newer beer from another brewery that excels at sour beers, the best way we can describe this is as the love child of lemon curd and beer. If you dig on bright and lemony, you should dig on this. An interesting combination of beers made this week's list. On one end two sour beers, on the other end two darker beers. Each pair also contained one low-to-moderate ABV beer and one on the high end of the booze spectrum. 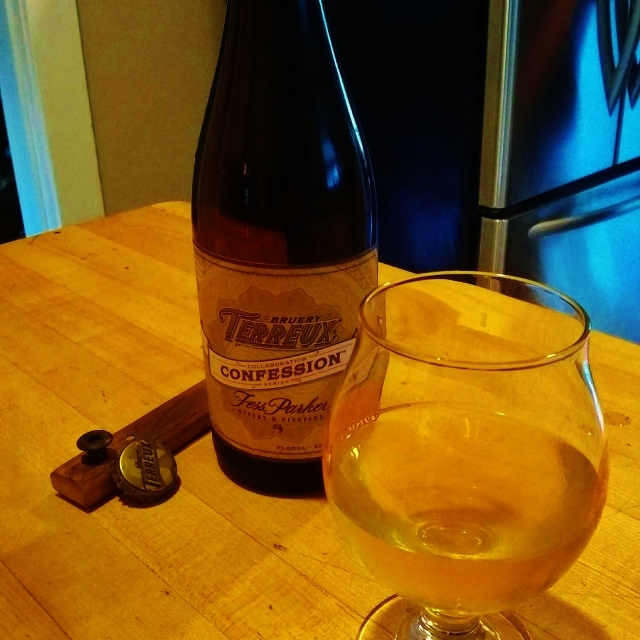 Bruery Terreux Confession - One of the beers gifted to us at our recent housewarming party, the Riesling characteristics of this variation on their sour blonde ale came out splendidly. Even at nearly 10% ABV this was quite easy drinking and we recommend sour beer lovers seek this out. Grimm Artisanal Ales Living Daylights - Hailing from New York, Grimm has recently come to the Portland market and this one was shared by a friend who loves sours. A Citra dry-hopped imperial Berliner Weisse (yet only 5.8%), it is also "aggressively dosed" with Mosaic and Simcoe lupulin powders. This may be the first lupulin powder beer we've had and we'll be keeping our eyes open to see what other breweries start experimenting with it, hopefully as successfully as this bottle of goodness. Fish Brewing Fish Tale Organic Porter - Bought primarily because it was Thursday (so we wouldn't be negligent on New Brew Thursday ticks) this was a surprisingly rich canned porter with an unassuming label. 5.5% with a medium body it has just the right combination of rich and bittersweet chocolate notes, finishing pleasantly dry. Hops ruled our week however in this season of fresh hop beers, only one of those made the list. We've found we've become less enamored with fresh hop beers on the whole in the last couple of years but it's still a joy to find ones that hit us just right. 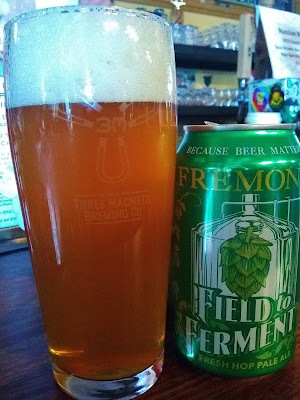 Fremont Field to Ferment Centennial - Field to Ferment is a series of fresh hop beers used with a pale ale base. Being that Centennials are the first that are ready to be harvested, thus they are the feature of the first batch. Yummy, yummy Centennials. Firestone Walker Propagator Generation 1 - An unfiltered IPA, it runs the line between those popular-right-now NE style IPAs and the typical West Coast IPAs. Whatever the style or un-style, when it comes to hoppy beers Firestone Walker is rock solid. Three Magnets Big Juice Smoothie - The biggest of the beers this week at 8.5%, it starts with a grapefruit aroma that follows through to the flavor and is accompanied by a bit of lactose to round the edges, all contained within a handy to-go 16oz can. The last beverage on this week's list is a cider and a simply amazing cider at that. Made by our favorite cidery, Reverend Nat's, and shared by one of our favorite (and generous) beer buddies, Chris, this cider is the result of Revelation Newtown Pippin, fortified with dark Muscovado sugar, being refermented in Elijah Craig bourbon barrels. 17% sounds daunting until one finds it in their glass and must resist the urge to grab the bottle and run. So. Very. Good. It's hard to believe that we are actually turning the corner from summer into fall but in addition to cooler weather (which will hopefully stick around) there are only two beer festivals on our radar for this weekend. One is a two-day event even, meaning no hard decisions about what to attend and what to skip or how to manage a marathon day of multiple events! This year marks the eighth year of the festival, a festival that was inspired by a photo snapped at the Cheers to Belgian Beers dart throw featuring four brewers named Ben. What started as a joke became a festival that rotates venues and increases more Ben brewers and beers each year. This year there will be nearly 20 beers and ciders available with the proceeds of the event benefitting Ben Flerchinger's memorial fund. 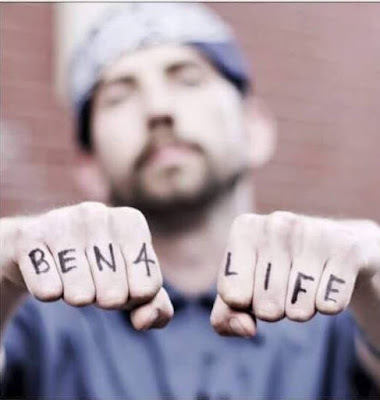 One of the original BenFest Bens, he passed away unexpectedly and suddenly earlier this year, leaving a hole in this beer community. In addition to the standard line-up there will be special tappings of cellared beers at 2pm, 3pm, 4pm and 5pm (4oz pours will be three or four tickets each). Those familiar with the area of 33rd and SE Hawthorne may have noticed that changes have been taking place at the former growler fill station, Growlers Hawthorne. Bihn Pham and Joe Rodgers purchased the business earlier this year, transforming it from a fill-only location (no consumption on premises allowed) to a more common model which allows for drinking on site or fills to go. Their grand opening celebration was the last weekend of July and this Saturday and Sunday they'll host their first beer festival. The festival is the brainchild of local favorite bartender (and employee) Jim Parker and it will fill their 35+ taps with beer, cider, mead, kombucha and soda by breweries that are self-distributed. Self-distribution, available to breweries producing up to 7,500 barrels/year, costs breweries more in time and manpower to sell and distribute their product with the trade-off being that they retain the full purchase price of the kegs sold. Breweries who contract with a distributor commonly split the profit, retaining 70%.